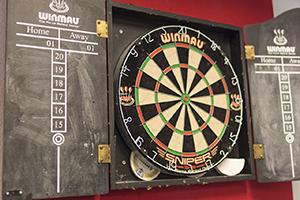 If you have a dartboard in your man cave, you have the opportunity to call the shots and play whatever game you please. Instead of sticking to the traditional gameplay found in pubs across the world, you can opt for something a bit more riveting. 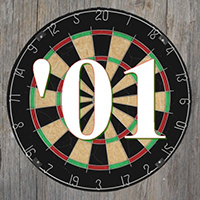 While most people don’t realize it, dartboards are not a one trick pony. There are many games you can choose from. Whether you’re playing with standard steel-tipped darts or on a plastic board, give these games a try the next time you’re hanging out in your man cave. Cricket is a unique game that requires you to think about every move. While other games can be won by the most skilled player, Cricket is a bit different. Novice players can easily dominate the board and take down a skilled player. The aim of Cricket is to “close” out all of your numbers. A scoreboard must be created. In the center of the board, write the numbers 20 – 15 in descending order. Also, include a spot for the bullseye. Each player will take a turn, aiming specifically at these numbers. The outer ring counts for double while the inner ring counts for a triple. To ‘close” a certain number, that number must be hit a total of 3 times. If a number is hit once, draw a slash next to it on the scoreboard. If it’s hit twice, draw an “X.” When it is hit the third time, the number is officially closed with a circle. To win the game, you must have more points than your opponent. Scoring is unique in Cricket. To win points, you must first close out a number before your rival does. For example, if you hit a triple 15 after closing that number out, you get 45 points. If your opponent hits a triple 15 after you’ve already closed that number, they’ll only get credit towards closing the number themselves and nothing more. These games are some of the most common. You’ve probably seen 501 being played at your local bar. At the start of every game, players are given a score. It can be 301, 501, or 701, depending on how long you want to play. The goal is to reach 0 points. With each throw, the points you accumulate will be subtracted from your starting score. While it may seem easy at first, it can get tough towards the end of the game. To win, you have to reach 0 by hitting a double. You can’t go below zero at all. So, if you have 12 points, you’ll have to hit a double 6 to win. As with other games, the outer ring counts for double points while the inner ring counts for triple points. This is a game for more experienced players. 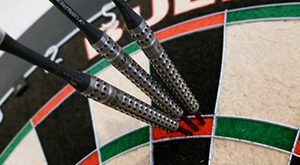 However, newer dart enthusiasts can give it try if they have great aim. One of the best things about Halve-It is that many players can join in on the fun. The “D” and “T” refer to “double” and “triple” respectively. The “DB” stands for “double bullseye.” These numbers are the only things you’re supposed to hit. Each player gets 3 dart shots per round. The aim is to hit the corresponding part of the board on the particular round. So for the first round, you must hit 20. Each time you hit it, you get a 20 added to your score. The maximum you can get for the first round is 60. This continues with all the players to move onto the next round. If you don’t hit the target number with any of your 3 shots, your score gets halved, hence the name. The player with the most points after all the rounds wins. Shanghai is best played when you have a large group of people playing. A grid scoreboard like that of the previous Halve-It game is required. There are 7 rounds in total. With each turn, players will have 3 shots to shoot at a specific number of the board. The numbers you will use are 1-7. So for the first round, your goal is to hit the 1 block. For the second round, you need to aim at the 2 block and so forth. If you hit the appropriate number, you’ll receive that score. As always, inner rings count for double points while outer rings count for triple points. The winner is the person with the most points after all 7 rounds. However, there is a way to win even sooner. 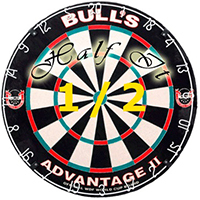 You can win the game by scoring a “Shanghai.” In dart games, a “Shanghai” refers to the act of hitting a single, double, and triple in the same round. It’s very rare, but can be achieved with a lot of practice. The act of hitting a “Shanghai” will put an end to the game and makes it possible for people to come back after being behind and win. Also referred to as Around the World, this game is one of the simplest games you can play. You don’t have to keep score, so it’s a great option if you just want to get a quick game in. To win the game, you must hit numbers sequentially until you reach 20. So, you’d start out by aiming for the 1 block. When you hit it, you move onto the 2 block. This continues until someone wins the game by hitting 20. You can also add the bullseye as the final game-winning shot if you want to make things more difficult. Players get 3 shots each. Double and triple rings can be used to your advantage. If you hit a double, you get to skip the next number. If you hit a triple, you get to skip the next 2. For example, if you hit a triple 1 during your first round, your next goal would be to hit a 4. Any shots that land outside of the number you’re currently on do not count for anything. If you’re playing with an opponent with a different skill level than you, Hare and the Hound is a great competitive game to play. One player is dubbed the “Hare” while the other is named the “Hound.” The Hare starts on the number 20 while the Hound starts at 5, which is just one space to the left. Both players must take turns to hit each number going in a clockwise motion. You won’t be going in sequential order, but rather the order in which the numbers are arranged on the dartboard. The Hare shoots first. Their goal is to make it all the way around the board and back to 20. If they do so, they win. The Hound’s goal is to catch up with the Hare and pass them. If they do this, they’re declared the winner. Killer is best played with at least 3 players. The more players there are, the more competitive the game will be. Each player will have one number designated to them. It’ll be the only number they hit. 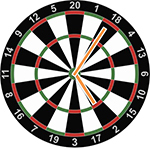 To figure out which number a player has, they must throw a dart at the board using their non-dominant hand. Whichever number they land on should be marked on the scoreboard. 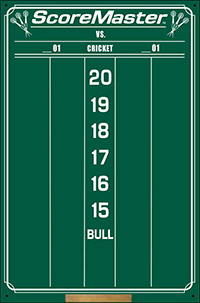 The board should display each player’s number and 3 lines. These lines refer to their lives. Each player will have 3 shots with every round. 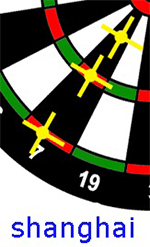 During the first few rounds, players must aim for the double point value of their number. From this point forward, the aim of the game for every player other than the Killer is to keep hitting their number and remain alive. The Killer can take away lives of players by hitting their double. However, other players can earn a life by hitting their own double. The last player standing next to the Killer is the winner. Each player will have 3 shots to get the most points possible. Every number is in play and the multiplier rings are in effect. After a player’s round is over, add up their score and record it. The very next player must then match or beat the score of the previous player. So if the first player earned a score of 42, the second must get a 42 or higher. Each player will have to play against the score of the player that went before them. Once the round is over, the first player will have to go against the score of the last player in the previous round. If you don’t meet or beat the score, you lose a leg. After you lose 3 legs, you’re out. The last player standing wins. This game involves a bit of math and a lot of strategy. You’ll need to create a scoreboard to keep track of the points that players earn. The aim of the game is to reach a score of 51. However, getting to that 51 is a lot tricker than it seems. Each player gets 3 shots for each round. The total of each shot is then added up. This total for the round is then divided by 5 to determine the point value. The number of times that 5 is able to fit into the round total is how much points the player will get for the round. For example, you hit a 12, 13, and 10 for a total of 35 that round. You would need to divide 35 by 5 to get your point total. In this case, you’d get 7 points. If the total score after 3 shots isn’t divisible by 5, you’ll get zero points for that round. One strategy that players often take is by only aiming at numbers that are divisible by 5. These include 5, 10, 15, and 20.